"PlayScience has been named among the best in family-friendly media by the Mom’s Choice Awards®"
NOTE: This is the same fun learning app as PlayScience I Lite with all levels purchased. If you're already bought levels in PlayScience I Lite, please don't buy this app. 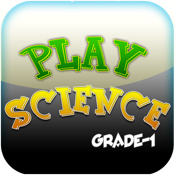 PlayScience will take you on a journey of educational fun like never before! For children studying in Grade 1 – PlayScience is the perfect way to build up their science skills. Your child will be able to enjoy a constructive, supportive, interactive fun filled environment while mastering different science concepts. Rather than downloading several disparate apps focusing on different concepts, PlayScience I is your one stop app to help your child learn all science concepts needed for Grade 1. It covers all the learning topics part of Grade 1 curriculum and has been designed with educational and child development experts. + As children progress through activities, they are able to read the concept associated with each such activity. + Keep track of the child’s progress. Play section: This section is divided into six units as per Grade 1 curriculum. Each unit consists of explanation of the concept followed by several exercises and activities for children to understand the concept well. The activities and exercises includes multiple choice questions, true/false statement, memory games etc. As children progress through these activities, they collect coins, which they can use to build an aquarium. Aquarium section: Children can use coins, earned from the Play section, to build an aquarium. They can buy different types of fishes, toys and plants for the aquarium. Try Increasing the volume and check that your device is not set to “Mute”. The Mute button is located next to the volume buttons on the side of the device. PlayScience I is eligible for the Apple Volume Purchase Program (VPP) for Educational Institutions. We will offer you special pricing for bulk purchase of apps. For more information about the Volume Purchase Program, you can consult Apple’s website. Have questions in mind? Feel free to contact us. PlayApps Inc is a member of Mom With Apps and kidSAFE seal, highlighting our commitment to your privacy and maintaining complete transparency about how our apps work.